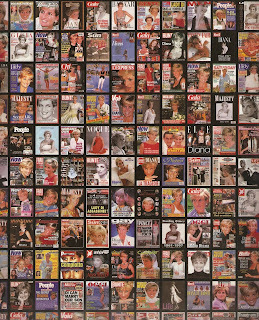 My abiding memory of the death of Diana, Princess of Wales twenty years ago this Thursday, is the almost surreal way the country was in limbo for a week following the tragic events in Paris. Half the country was in mourning for a woman they'd never met while the other half were bemused by their reaction. Mind you that didn't stop cynical old me recording some of the radio output on that Sunday as broadcasters tried to come to terms with the news and how to handle the death of a royal for which there'd been no rehearsals. I didn't start recording earlier enough on Sunday 31 August 1997 to hear how the news was broken to the waking nation. By 10 am Radio 1 was already using back-to-back ambient music - some of the tracks are listed below - interspersed with announcements from Mark Goodier and extended news reports here with Richard Evans. Many commercial radio stations came together to take IRN's bulletins and played instrumental tracks. I'm sure they featured more than just Kenny Gee's Songbird but that's all I recorded and have heard since on other recordings. This segment starts at 11.30 am and was taken from Viking Radio. 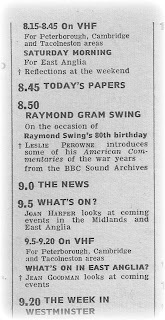 Radio 2 dropped its morning schedule (Good Morning Sunday remained but shifted to 9 am) and under normal circumstances would have aired a pre-recorded Desmond Carrington show at 1 pm. Des and producer Dave Alyott convinced controller Jim Moir that they could handle a live show from their home studio with an appropriate playlist. This recording starts with an extended 12-minute news bulletin read by Paul Leighton. Back to Radio 1 and at 4 pm listeners would've expected to hear the UK Top 40 but both the BBC and the Network Chart from Capital were cancelled as a mark of respect. At the start of this recording Lisa I'Anson introduces Tina Ritchie with a 3-minute bulletin and then an announcement from Mark Goodier. Both Radio 4 and 5 live combined resources throughout the day. This news special with Charlie Lee Potter and Allan Robb was broadcast at 5 pm. Following the week of almost suspended animation, that and the clamouring for a public display of grief from the royal family, the funeral occupied most of the airtime on Saturday 6 September from 8.30 am. This is part of the BBC coverage carried across all stations. The announcer is David Miles and commentating in this clip are James Naughtie and Chris Stuart. There are other off-air recordings from 31 August 1997 available online. Radio Tapes has airchecks from CBS and ABC in the States plus the BBC World Service as relayed by Minnesota Public Radio KNGA. The Shortwave Radio Audio Archive has more BBC World Service coverage. This webpage recreates the original MHP Pick of the Continuity Announcements page with reinstated audio and looks at the timeline mainly from a TV perspective. In this blog post Matthew Rudd recalls working overnight at Viking FM as the news broke. Nights Interlude - Nightmares on Wax. There is an interesting sidebar to the history of BBC in its pre-local radio era when the corporation was still wedded to 'the Regions'. Tantalising glimpses of it are evident in back issues of the Midlands editions of the Radio Times showing programmes "for East Anglia". The story of this 'hidden' network is told in the BBC Radio Norfolk documentary The Network That Never Was to be broadcast on Bank Holiday Monday. The Network That Never Was is a companion piece to Radio in a Roundabout Way that aired in 2012. In that documentary Paul Hayes, who has produced both programmes, concentrated on the Radio 4 VHF morning opt-outs for listeners in East Anglia from the late 1960s until 1980 when Radio Norfolk came on-air. This new documentary rewinds the story to the late 1950s and early 60s when VHF broadcasting was still in its infancy and only one in five wireless sets had a VHF waveband. First, a brief history lesson. Regional broadcasting had existed since the late 1920s but had been collapsed, together with the National Programme, into one Home Service during the war. 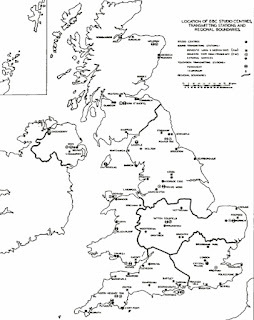 Post-war the BBC offered a main Home Service schedule emanating from London but with programme contributions from the regional centres. If you lived in one of the regions your own regional Home Service carried its own alternative programmes at certain times of the day complete with its own announcers and news bulletins. Home Service programmes from London. 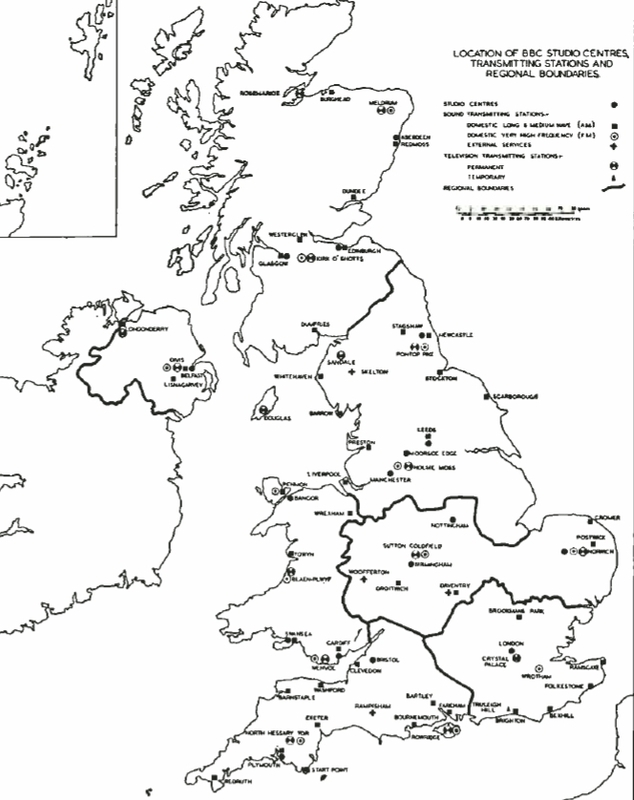 It was the introduction of VHF broadcasting in the mid 1950s that allowed for what the BBC termed "area broadcasting" as each of the new transmitters covered an area smaller than the existing regions. The idea seems to have brainwave of the forward-thinking Head of Programmes for the West Region, Frank Gillard (who would later be critical in the roll-out of BBC local radio) who proposed An Extension of Regional Broadcasting to his BBC bosses in February 1955. When the transmitter mast at Tacolneston, south-west of Norwich, was constructed in late 1956 it allowed that area to offer occasional opt-outs from the main Midland Home Service programmes, though usually only 10 or 15 minutes at a time. By 1958 the BBC Handbook was reporting that "the Norwich transmitter, which comes under Midland Region, is putting out, in addition to news, talks and discussion of purely East Anglian interest, which will be heard only by listeners with VHF sets in East Anglia". This had followed a similar area split in the north-east when Pontop Pike came online and was also a service offered to listeners in Devon and Cornwall, part of the West of England region, when the transmitter mast at North Hessary Tor was brought into commission. VHF-only programmes aimed at the East Anglia audience started on Tuesday 5 February 1957 with an introductory 10 minutes linked by former talks producer David Bryson who'd been appointed as the BBC's 'East Anglia Representative'. 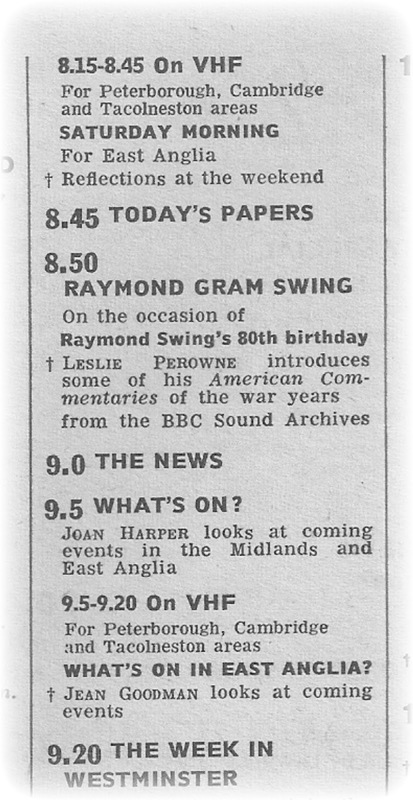 Early programmes were either news bulletins, just one a day after the main six o'clock news for the first decade, a 5-minute Saturday teatime sports report with Ted Chamberlain, a programme for farmers with Gordon Moseley, a what's on guide, a topical magazine initially billed as East Anglian Highlights and a series of talks and stories under the title Through East Anglian Eyes, an early contributor being Eric Fowler. The small team based at St Catherine's Close off All Saints Green in Norwich didn't just produce these VHF-only opt-outs but contributed programmes on behalf of the Midland region such as Signpost and Midlands Miscellany. Signpost was a 10-minute magazine programme alternating Monday to Thursday across the Midlands region with the West and South Midlands produced by the talks staff in Birmingham on Monday and Wednesday, the East Midland Representative based in Nottingham, Gerald Nethercot (later the first manager of BBC Radio Nottingham), looking after Tuesday and East Anglia featured on Thursday. 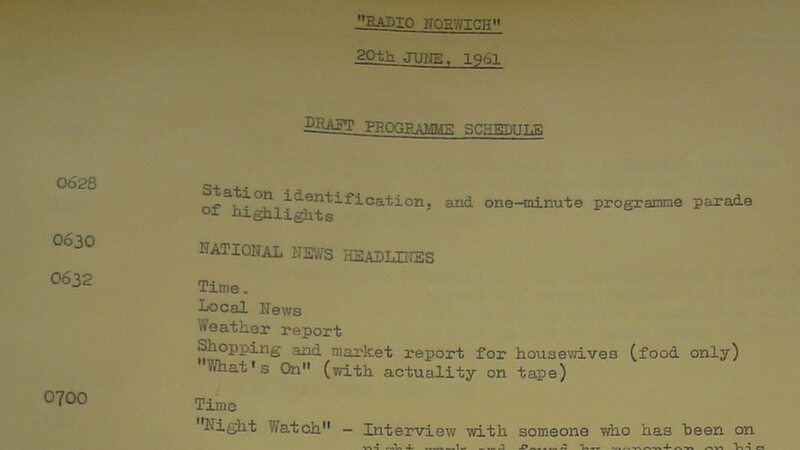 The Norwich team also produced occasional editions of shows heard nationwide including Woman's Hour, Morning Story and a series called Down to the Sea. In 1959 the adjoining TV studio went into service to allow interview contributions to the network and a short regional nightly news bulletin. for The Network That Never Was). All this seems rather low-key but the area broadcasting from Norwich did occasionally hit the jackpot. 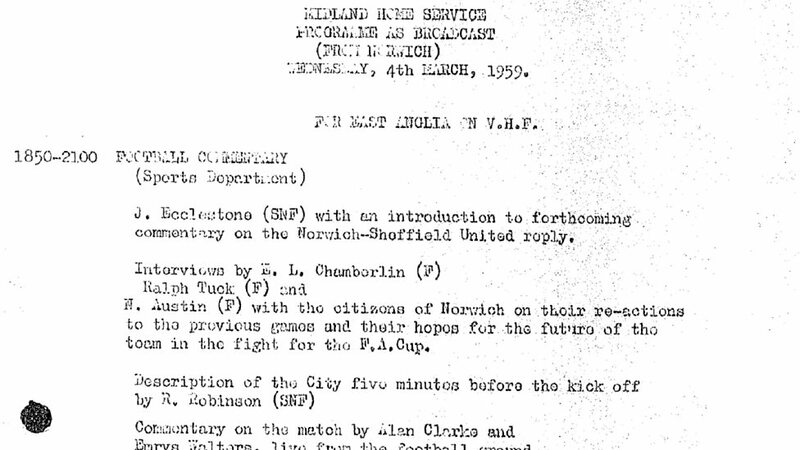 In 1959 Third Division Norwich City had an unexpected run to the semi-finals of the FA Cup that captured the nation's imagination. The VHF service was able to obtain agreement to broadcast full live commentaries of Norwich's midweek replays against Spurs, Sheffield United and Luton Town. This was something of a broadcasting coup as few full match commentaries were ever aired aside from the FA Cup Final itself. The commentary for the whole game was provided by team that would normally just do the second-half coverage for the Light Programme. 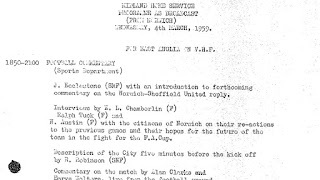 BBC records for the 4 March replay against Sheffield, for instance, show that Allan Clarke and Emrys Walters commentated both for the East Anglian VHF service and the Light Programme with John Ecclestone, the regional programmes producer, introducing the coverage. 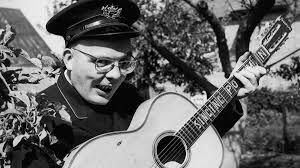 But perhaps the East Anglian VHF service's most interesting contribution, even if of dubious cultural value, to the national consciousness was the rise to (albeit brief) fame of Allan Smethurst, aka The Singing Postman (pictured above) who became something of a TV celebrity with the song Hev Yew Gotta Loight, Boy? An audition tape had been sent in to Ralph Tuck who, in 1965, was presenting the Wednesday morning opt-out called, somewhat unimaginatively, Wednesday Morning, billed as "notes on the people and happenings of the week". Smethurst became a regular guest on the programme with his Norfolk dialect songs. They were picked up nationally when Jack de Manio featured him on Today and an EP of his songs was released by Ralph Tuck's own Lowestoft-based record label. The story of The Singing Postman is told is this 1967 film held by the East Anglian Film Archive. Seemingly nothing of the East Anglia news bulletins has survived in the archives but listeners in that area may recall the name of the grandly titled Lieutenant-Colonel R. E. S. Ingram-Johnson who read the news between 1958 and 1967. Known to friends and colleagues as Inkie he'd served in the Dogra Regiment in India and on the North-West Frontier where he happened to gain experience as a sports commentator. With the BBC in Norwich he did occasional football and cricket reports as well as reading over 2,000 news bulletins. The other well-known voice from the VHF-only service is surely Jean Goodman. A Yorkshire-born print journalist she'd moved to Norfolk on her marriage and became a features writer for the Eastern Daily Press. With the arrival of the radio service from Norwich she became a regular correspondent and presented the What's On in East Anglia? slot until it ended with the close of the Home Service in 1967. 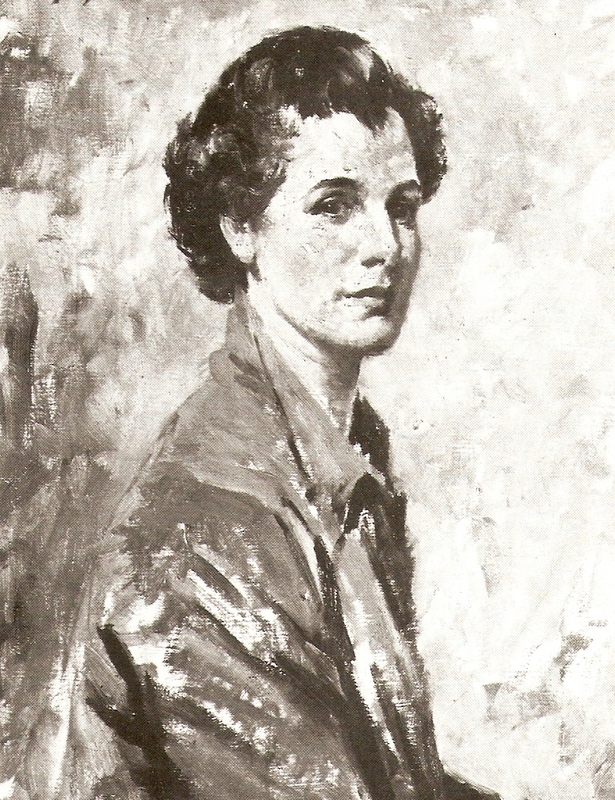 From 1956 to 1978 Jean was a regular contributor to Woman's Hour and on several occasions would present the programme when it came from East Anglia. She briefly worked for Anglia TV and reported for BBC1's teatime news programmes East at Six-Ten (and later Look East) where in November 1963 she interviewed the Beatles. Disappointingly her 1973 autobiography Anything But Housework fails to virtually mention none of this with not a single specific reference to the BBC or Woman's Hour and of the meeting with Britain's top band she only writes "I had incurred the wrath of the Beatles' road manager, by offering one of the priceless quartet a powerful cold-cure tablet, just before a performance". Jean made regular appearances on the Radio 4 VHF opt-outs This is East Anglia and Roundabout East Anglia. She died in 2003. The Network That Never Was also tells the story of the BBC radio station that never actually made a public broadcast, 'Radio Norwich'. This was one of a number of closed-circuit pilots organised by Frank Gillard as part of his plan to convince BBC management and ultimately the Pilkington Committee on Broadcasting of the corporation's case for providing what it called "the fourth service", i.e. the introduction of local radio. Again a plan that rested on the expansion of the VHF transmitter infrastructure. The experimental station was a one-day affair, running from 6.28 am to 7.32 pm on Tuesday 20 June 1961, and followed earlier trails in Gillard's West region in Bristol and Portsmouth. Jack Johnston, the assistant news editor for the Midlands region in Birmingham came over to run it with producers Marigold Lawton, Michael Ford (later a Radio 2 Pebble Mill based producer) and Michael Gilliam. Fortunately the radio correspondent of The Times provides plenty of evidence as to what was planned for 'Radio Norwich' and it does indeed sound like the blueprint for the local radio services that followed. One of the features of this one-day experiment, which is under the aegis of the Midland Region, will be a radio-car touring the city and broadcasting direct into the programmes from various parts of the area. The day's programmes ... will comprise news, talks, discussion, music, guides to shopping and general entertainment. A programme specially selected designed for Norwich schools, interviews with tourists and holiday visitors to the city, local politics and hints on food prices will be included. There will also be a request gramophone record programme entitled Your Street, in which people from a selected street will choose records for friends and neighbours; details of jobs available at the local labour exchange, and interviews with men serving in the 1st and 2nd East Anglian Regiments in Germany. Today's programme was not a blueprint of the real thing. The plan was to try out as many ideas and features as could be conveniently fitted into the day's broadcast, so there was a much higher proportion of speech than would normally be the case. Secondly, the interviews were not all of the first rank and in one or two instances were unable to draw their subjects into the lively dialogue so vital for this type of service. Nevertheless, it was clear that the framework of a worthwhile service was present and, as Mr David Porter, head of Midland Regional programmes, said, a selection and improvement would be based on today's performance. It was likely that a programme as presented today would in reality be stretched over several days. In fact, as everyone present realised, unless this was done it would be difficult if not impossible to find sufficient material to keep going. 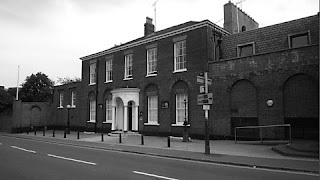 An obvious fault, considering that much of the service will be a background to the housewife's daily chores, was the length of interviews with citizens of Norwich. Some of these extended to five minutes or more with one person. 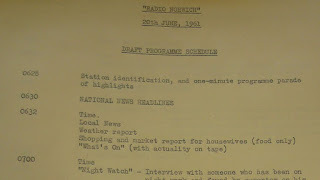 The programmes that seemed to go well were a live broadcast from a local market telling listeners what was available and at what prices (the reporter for this piece just happened to be Jean Goodman) and one in which letters from local residents were read out and, in the case of criticism, answered by the local council. "This roused some lively altercation" reported The Times. Of course as we now know the sixteen closed circuit experiments gave the green light to the roll-out of the BBC's local radio stations from 1967 onwards. But ironically Norfolk and surrounding areas weren't included in that first tranche and had to wait until 1980 for the launch of BBC Radio Norfolk and a further ten years for BBC Radio Suffolk. That's why, to fill the gap, the BBC continued to provide a limited area service with Radio 4 opt-outs throughout the 70s. And that's the story previously told in Down Your Local - Roundabout East Anglia. The Network That Never Was can be heard on BBC Radio Norfolk at 12 noon on Bank Holiday Monday. With thanks to Paul Hayes. 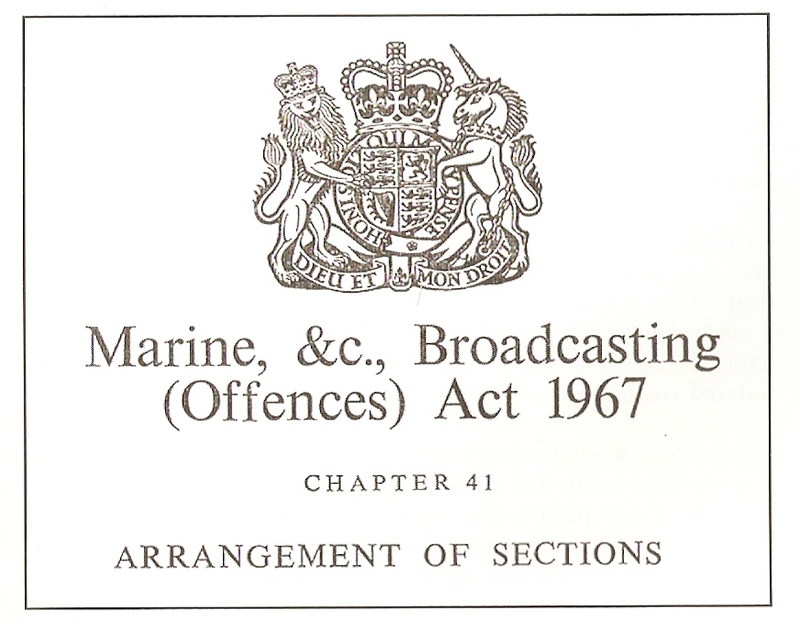 'It shall not be lawful for a broadcast to be made from a ship or aircraft while it is in or over the United Kingdom or external waters, nor shall it be lawful for a broadcast to be made from a ship registered in the United Kingdom, the Isle of Man or any of the Channel Islands or an aircraft so registered while the ship or aircraft is elsewhere than in or over the United Kingdom or external waters'. 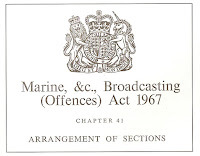 So begins one of the most significant pieces of UK broadcasting legislation, the infamous Marine, and &c., Broadcasting (Offences) Act 1967, enacted on 14 July 1967 and coming into force a month later, exactly 50 years this coming Monday. Plenty has been written about that golden era of the offshore pirate stations and the machinations that ensued to kill them off - I have a large selection of such tomes on my bookshelf - so I'll not attempt to summarise it here. What better way to celebrate the pirate radio days than with a couple of airchecks from two veteran broadcasters. I'm not sure how widely available these recordings are but they were given to me by ex-City and Caroline DJ Tom Edwards. Firstly from 6 September 1966 its Roger 'Twiggy' Day "moving and grooving" on his evening show on Radio England. The second offering is Paul Burnett broadcasting on Radio 270 off the coast at Scarborough. This is part of the breakfast show from 14 February 1967. Over the weekend you can relive the Swinging Sixties on Pirate Radio Essex live from onboard the LV18. And on Monday evening over on BBC Radio 2 there's Johnnie Walker Meets ...the Pirates.